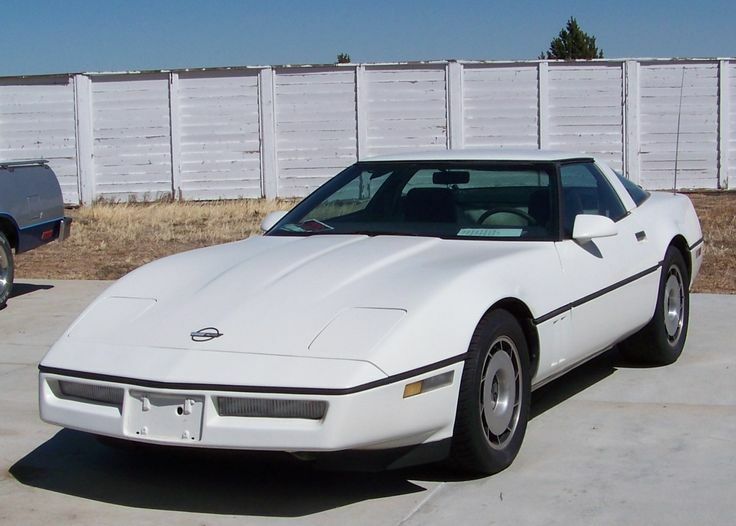 I came across this story where on this day back in 1994 a Pennsylvania man, George Swanson gets buried with his beloved white 1984 Chevy Corvette. He was 71 years old and it was his last wish that he have this unusual resting place. As you can imagine the logistics of making this happen did not happen overnight. Swanson had been planning this for quite some time and had bought 12 burial plots at the Brush Creek Cemetery just outside of Pittsburgh. Swanson was a Former U.S. Army Sgt. in World War II as well as a local beer distributor that had made a decent living for himself and his wife, who also drove a white Corvette only it was a 1993. 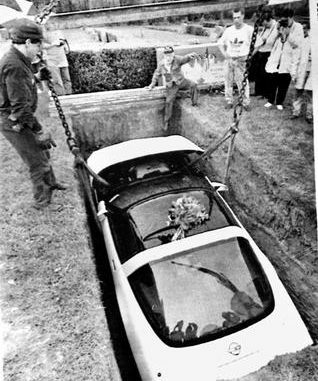 Swanson actually passed away on March 31st but even though he had made all the proper arrangements for him and his car to be laid rest together forever, but just after his death the cemetery backed out of the deal. They claimed that the concern of vandalism was too great to allow something like that to happen. But really what was most likely the case was they were concerned about what other patrons of the cemetery would think of this abnormal ceremony. It took weeks of negotiating before a compromise was made, they required that all the fluids be drained from the car so as to protect the environment, (like they weren’t going to do that anyways) and most importantly that the burial be done in private. So on that day Swanson’s wife, Caroline, drove to the cemetery in her Corvette with her husbands ashes riding shotgun. More than 50 people showed up to pay their respects as a crane lowered the white 1984 Corvette with Swanson’s ashes sitting in the front seat into a massive 7 feet deep, 7 feet wide, and 16 feet long hole where he would rest a happy man. George made it very clear that he wanted to go out in style, and I would say he did a great job of it. As a fellow gearhead I can appreciate that, there is something in our veins that allows us to connect with these vehicles and have a respect for them that most people may not understand. As I researched this story I learned that there are actually quite a few of these stories out there, one even involving a Bentley. This isn’t you’re everyday story, most people will think this is absolutely ridiculous and maybe it is, but if you have ever loved a car or truck then it wont’t come as much of a shock. Cars and trucks are not just a way to get from point A to B, they are the place that you had a first kiss, or that one great road trip. They are a part of some of the better memories of most peoples lives. With that being said its almost a wonder why more people aren’t doing this.